In her acknowledgments, author Kate Messner thanks her editor for supporting "a magical-ice-fishing-Irish-dancing-heroin novel for kids." It sounds insane, but that's exactly what The Seventh Wish is, and it is excellent. I wish that a book about heroin addiction in a family wasn't necessary, but it is. In the past ten years, heroin overdoses have skyrocketed and many people are affected by this epidemic. Messner has written a book that opens discussions and provides insight, which could help young readers be more sympathetic and less likely to get involved in the first place. The book isn't only about a dramatic addiction in the family. 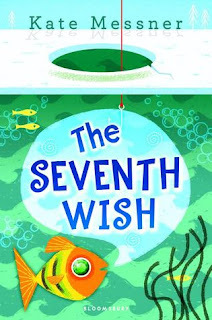 Protagonist Charlie catches a fish that gives magical wishes, which sets the whole story in motion. This touch helps temper the very serious family issues. She is also an Irish step dancer with wonderful friends. I love that they support each other and that there is no additional drama from them about Charlie's family problems. I've already got all my read-alouds planned for the year, but I will make it a point to read the first chapter aloud to the class to get them interested. The more people who read it, the better.